Is Busing Seniors to Meetings Wrong? 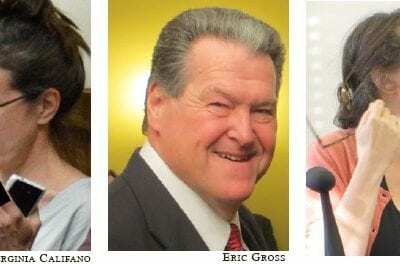 Two members of the Putnam Legislature want State Attorney General Eric Schneiderman to investigate whether or not the county acted properly by transporting a bus load of senior citizens from the Cold Spring area to Carmel in order for them to attend… Please login below or purchase a subscription to the Putnam County Courier to access this content. Three of the students joining Mary Sullivan who chatted with the World War II sailor at Arlington National Cemetery are Brendan Burns, Michael Seaman and Gabrielle Araujo. Students at the Henry Wells Middle School in Brewster have learned the real me… Please login below or purchase a subscription to the Putnam County Courier to access this content. Sgt. Paul Italiano and his canine partner Falco, wearing his new vest, in downtown Brewster. 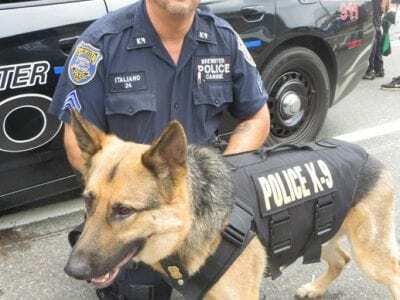 Putnam County’s newest canine police officer, K-9 Falco, now has his own bulletproof vest. The German Shepherd, who joined the ranks of the Brewster Po… Please login below or purchase a subscription to the Putnam County Courier to access this content. 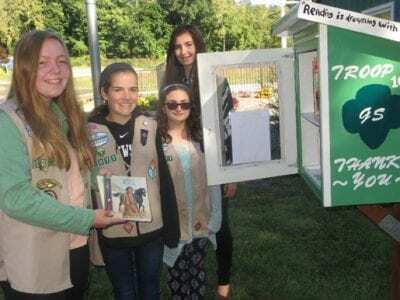 Brewster Girl Scouts Erin Brann, Meaghan Feehan, Izabella Mancini and Chloe Stalker fill one of their mini-libraries. Four young women, members of Brewster Girl Scout Troop 1077, are promoting literacy in a most unusual way. The women, Meaghan Feenan… Please login below or purchase a subscription to the Putnam County Courier to access this content. 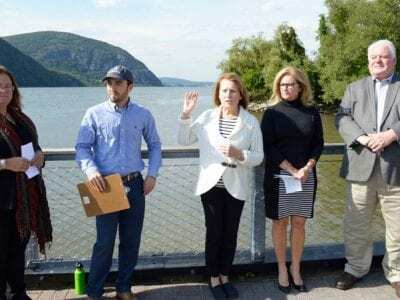 Athena Mullarkey of Scenic Hudson, Jeremy Cherson of Riverkeeper, Legislator Barbara Scuccimarra, County Executive MaryEllen Odell, and Legislator William Gouldman converged over the anchorage discussion at Cold Spring. Behind them is Storm King. 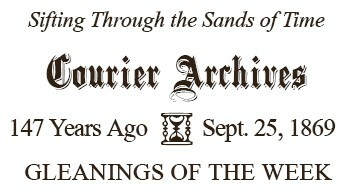 The… Please login below or purchase a subscription to the Putnam County Courier to access this content. Alfred State welcomed a new class of freshmen this fall. The college offers educational opportunities in nearly 50 associate degree programs, 23 baccalaureate degree programs, and two certificate programs in the schools of Arts and Sciences, Archite… Please login below or purchase a subscription to the Putnam County Courier to access this content. Former Cold Spring Trustee Stephanie Hawkins and Legislators Kevin Wright and Dini LoBue have repeatedly found issue with and spoken out against a new senior center at the former Butterfield Hospital in Cold Spring. Hawkins is shown at a village meet… Please login below or purchase a subscription to the Putnam County Courier to access this content. The total receipts at the State Fair were $15,000. Earthquake shocks are alarming the people of California. All the members of the Cabinet are now in Washington. The Connecticut town elections take place two weeks hence. Mrs. Stanton has writt… Please login below or purchase a subscription to the Putnam County Courier to access this content.